There were worldwide reactions of disgust to the National Enquirer’s decision to publish a photo of Whitney Houston’s body in an open casket on its front page this week, but the magazine has stood by its decision. Publisher Mary Beth Wright refused to name her source, but called the picture a “work of art”. Speaking to Fox News, Mary Beth Wright said: “I thought it was beautiful”. The decision to run the snap has been slammed by media outlets, fans of the star, and social media users around the world. Also among those condemning the magazine has been funeral director Carolyn Whigham, of the Whigham Funeral Home. She has strongly denied leaking the picture, telling the LA Times: “We have no comment. But it was not the funeral home… Whitney was a personal friend to me and my family. There’s some precedent for the National Enquirer’s ghoulish glimpse at Whitney Houston’s wake. 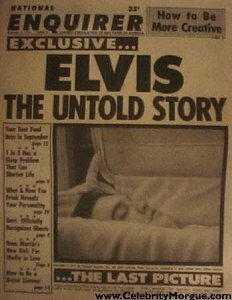 The tabloid ran similar open casket shots of Elvis Presley after the King of Rock died in 1977. Just as it did with Elvis Presley, the headline loudly proclaims that it is “the last photo” taken of Whitney Houston. The National Enquirer also teases some other tawdry details about the Whitney Houston viewing. Whitney Houston was reportedly outfitted in her favorite purple dress, $500,000 worth of jewelry, and had gold slippers on her feet.